As far as watch collecting stories go, I think this is a pretty good one. 2012 – I was on a bit of a tear for F.P. Journes. I had a Chronometre Souverain (regret I sold it) and a Reserve de Marche (bought it and sold it quite quickly). What I have always been interested in are smaller watches, and at the time, the 36mm Octa Divine in particular, technically part of the ladies’ collection. F.P. Journe didn’t make very many of them and I had certainly never come across any in the wild. Eventually, while I was in New York trying to set up The Armoury Tribeca, I found a dealer in California that had a second-hand one available. The price was okay so I bought it. About two years ago, the date wheel of the Divine stopped advancing. I had a colleague drop it off at the New York boutique. A few days later, I got an alarming e-mail from F.P. Journe saying the watch was stolen property. I was asked to produce all of its paperwork so F.P. Journe could ascertain how I got a hold of it. And I was also told the watch would not be coming back to me. It was to be confiscated and returned to F.P. Journe’s insurer. Why the insurer? Because the watch was stolen from its Paris boutique ten years earlier. Of course, being a good citizen as well as an avid keeper of e-mails, I provided F.P. 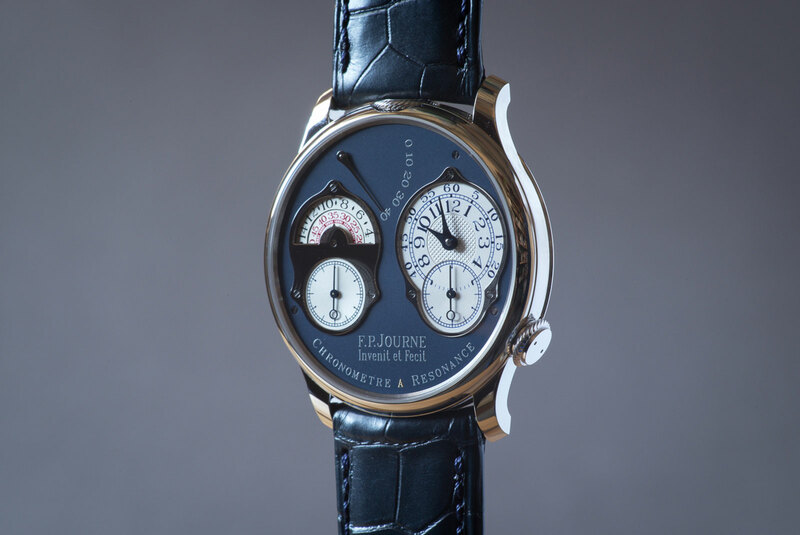 Journe the entire thread of communication between myself and the dealer, as well as my wire transfer receipt. As I had proved I had unwittingly bought stolen property, I was no longer a suspect though I was certainly poorer by one watch and its purchase price. The issue was handled by Pierre Halimi, the head of Montres Journe America. Over our calls and e-mails, we developed a rapport and he invited me to visit him at his New York boutique next time we were both in town. I was happy to put a face to the name and we met late last year. We got to know each other and I explained what I did, namely The Armoury and Drake’s. During the chat at his boutique, two of my favourite customers at The Armoury Tribeca came through the door. I had not realized that one of them, JS, was one of the most important collectors of F.P. 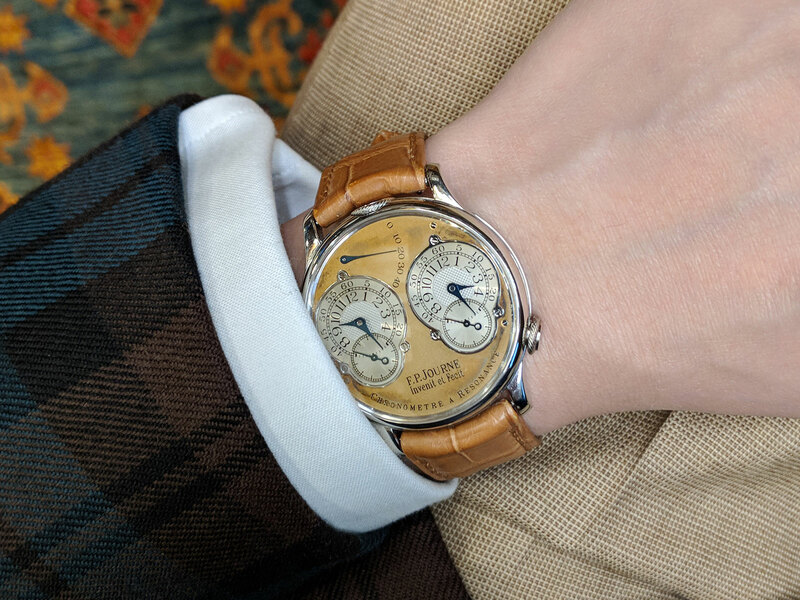 Journe in the United States. The pair joined in on the conversation and Pierre decided it would be worth his time to check out what The Armoury did down in Tribeca. He came the next day, loved it and we discussed doing some events together, which eventually became a little presentation on different types of tailored clothing for F.P. Journe customers at The Armoury. It was a fun event and hopefully people learnt something. Given my love for smaller watches, I often talked to Pierre about how I missed the 38mm – and smaller – case that F.P. Journe used to produce. Francois-Paul himself is occasionally willing to make a one-off piece for the brand’s best clients. Pierre knew JS and I had a good relationship, so he asked if JS would be willing to request a one-off, 38mm piece on my behalf as a custom, “application” watch. JS was interested in seeing what might come of this, so he agreed to forward my application. Pierre also very kindly lent me his 38mm Resonance, one of the few with a dial that had patina’d quite strongly, and allowed me to keep it for a while. It ended up being four months, with me very regularly wearing Pierre’s watch. I was thrilled that a one-off 38mm watch was on offer, and what form this watch would take was often on my mind. I made some basic renders using Photoshop and existing imagery of F.P. Journes that I liked. I showed some of the renders to my colleague Jan, who made the good point of asking if they could make more than one, as we probably had some friends that might like an “FPJ Mark Cho Special”. I also showed the renders to JS, who liked how the project was developing and was willing to expand the application to a small batch of watches. So I kept on with the renders, aiming to make something that might appeal to him and a small group of friends. Around March this year, I was in London checking out the Andreas Gursky exhibition at the Southbank Centre in London and I hit upon one large photograph that had the perfect colours: shot from up high, a scene of a blue-grey ocean with cream and taupe cliffs. I put it together in Photoshop and after some tweaking, finally had something interesting. Then I thought about the watches that really resonated with me – pun intended. 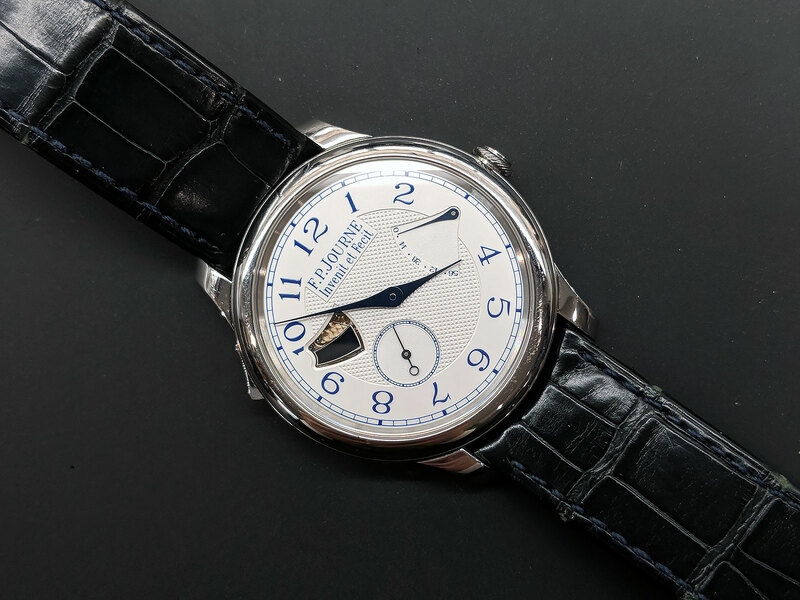 The first would be the Souverain minute repeater, the only serially produced model with a white dial and navy markings. JS owned one and let me have an extended look at his. I was smitten. The second was Pierre’s personal Resonance, the only one I had ever come across that developed such a patina. I love the Resonance, not just aesthetically but as a horological feat. Spending quality time with Pierre’s piece put me down the path of trying to make a special version for myself. I had some mockups of a white-dial Resonance in the repeater’s colours but I wasn’t fully convinced. Then I considered what really drew me to Pierre’s watch – the soft, faded colours of the dial and its markings. Thus I aimed to make a modern Resonance that was a little less stark in appearance, an homage to a well-worn Resonance. 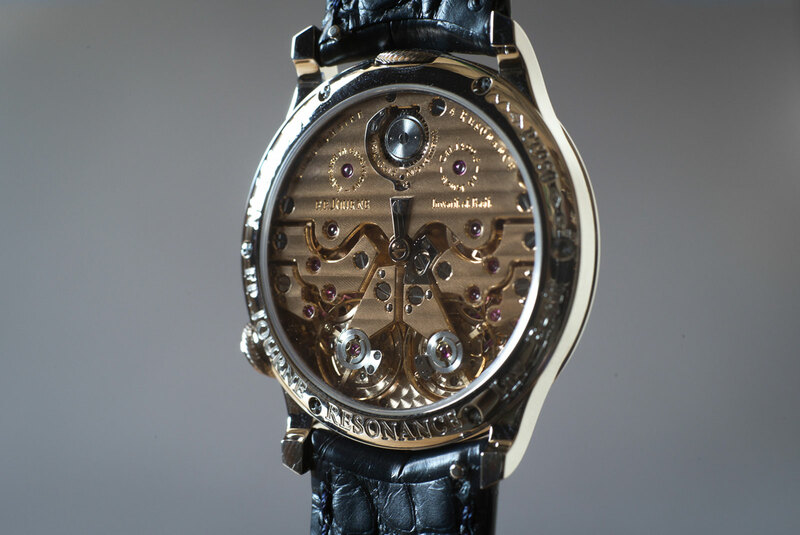 In the end, we used Gursky’s ocean colours and warm land tones for the main dial and its lettering. 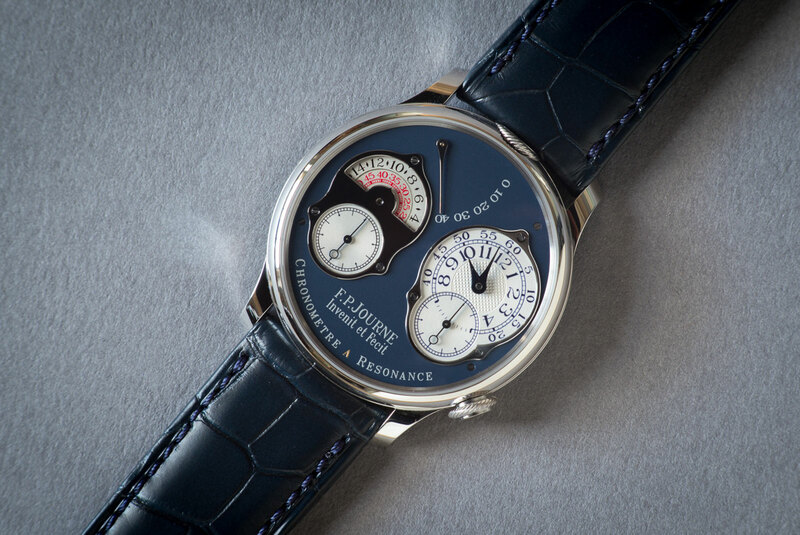 For the right side sub-dial, it was the repeater’s white and navy combination. We submitted the application and awaited Francois-Paul’s response. I couldn’t really believe I had come so far, and had I been outright rejected, I certainly would have held no ill will. Or I might have been shattered, it’s hard to say. Fortunately, it did happen. F.P. 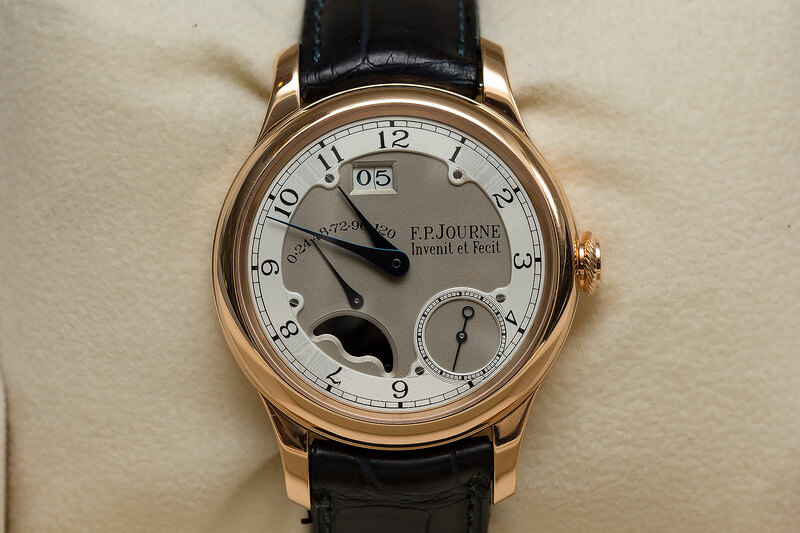 Journe agreed to use the last of their 38mm platinum cases to make five “FPJ Mark Cho Specials”, which were just delivered last week. JS, who let me borrow his repeater, three of my good friends, and myself each have one. As I met all these people through The Armoury, I also requested that the “A” in “Chronometre à Resonance” be printed in The Armoury’s signature gold, which F.P. Journe kindly obliged. As for the stolen Octa Divine 36 that started the whole tale: I contacted the dealer, who unfortunately was uncooperative with a refund, suggesting instead that they would direct me to the original seller of the watch and I should speak to that person. I had to resort to legal means, after which they eventually settled with me. I recovered the price paid for the watch plus a portion of my legal fees. With Pierre’s help, I also managed to buy the Octa Divine 36 from F.P. 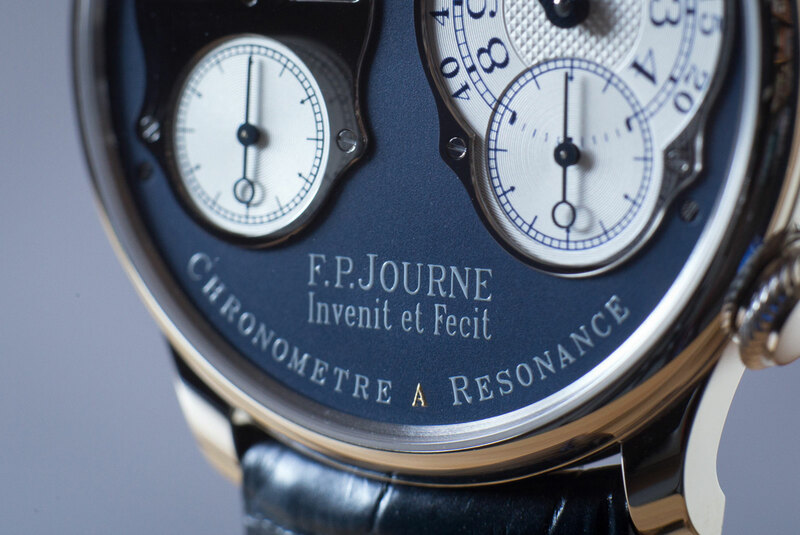 Journe’s insurer at a significant discount, as they were not interested in holding onto a watch that they had paid out for ten years ago. The watch was already in Geneva, so I asked F.P. Journe to service it before returning it to me. A year and a half after it first broke down, I finally got the watch back, and it eventually cost much less than I had paid for it six years ago, even with the legal bills and servicing. I was struck by how great the watch looked after servicing, certainly much better than I remembered; kudos to F.P. Journe. The road was winding but I’m glad I could take it. 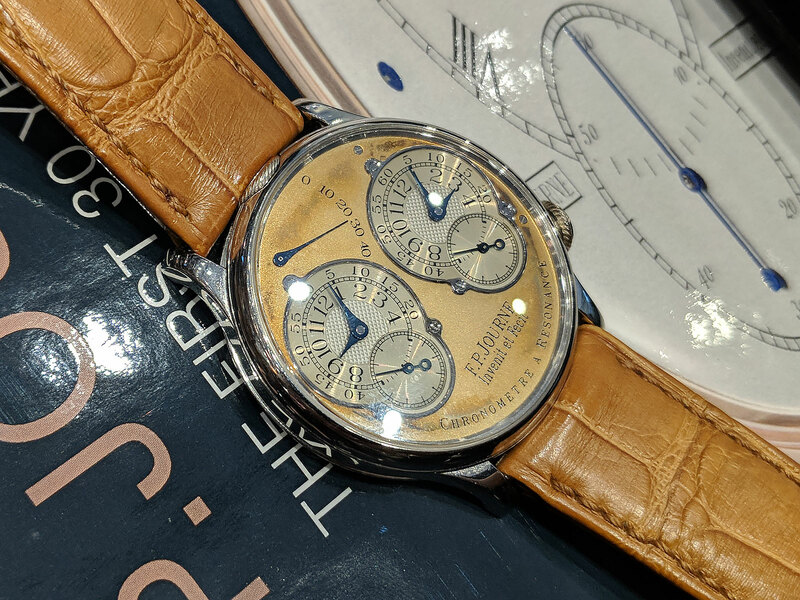 I made new friends, met great people, got a very special watch from one of the watchmaking greats, and am now the proud owner of two very special F.P. Journe pieces. Special thanks to F.P. Journe, Pierre, JS, William, and Adam Marelli, who produced the portraits of the watch, and everyone else who helped me along the way. Nice when things turn out better than expected, eh? PS: The Resonance is turning 20 this year and there will be a special version produced only in 2019, after which it will be replaced by a new model; SJX Watches has a great write-up about it. Mark Cho is the co-founder of The Armoury, a menswear and accessories shop for the discerning gentleman with outposts in Hong Kong and New York. He is also one of the owners of Drake’s, the English maker of ties and pocket squares. F.P. 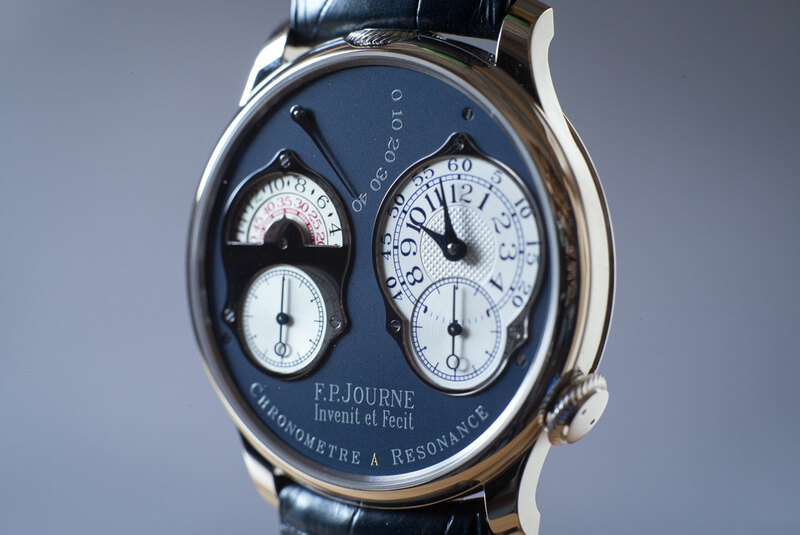 Journe's self-winding wristwatches get a coffee coloured dial that has a tropical flavour.